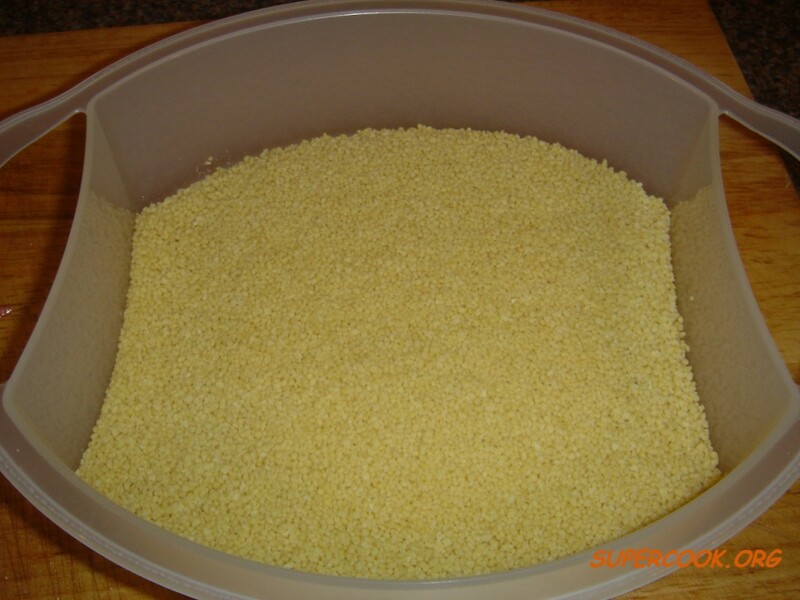 Couscous or kuskus is a dish consisting of spherical granules made by rolling and shaping moistened semolina wheat and then coating them with finely ground wheat flour. 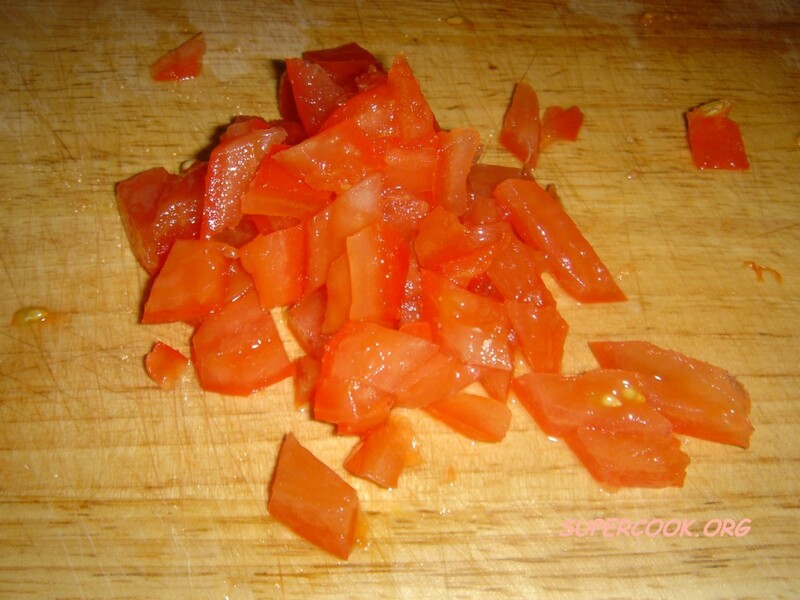 The finished granules are about one millimetre in diameter before cooking. Left: A Moroccan couscous with vegetables and sweet toppings. 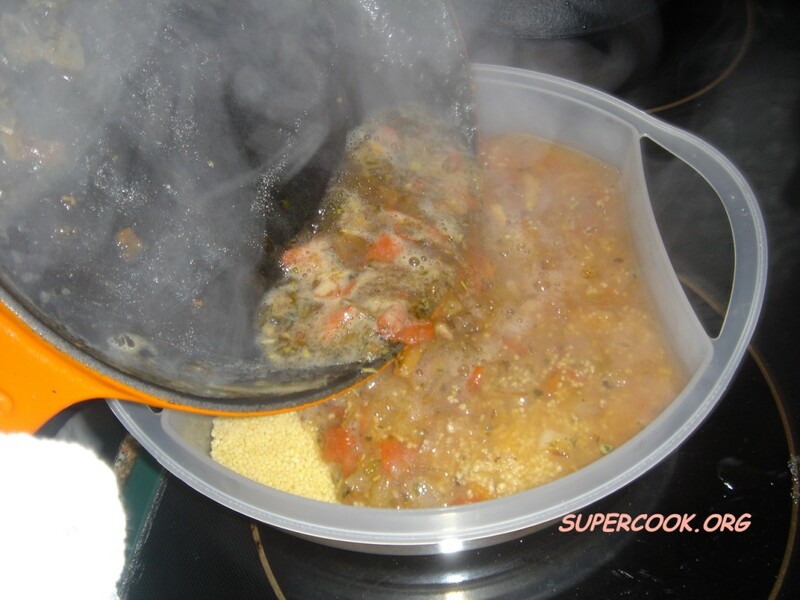 Traditional couscous requires considerable preparation time and is usually steamed. In many places, a more-processed, quick-cook couscous is available and is particularly valued for its short preparation time. The dish is a primary staple in Morocco, Algeria, Tunisia and Libya. It is also popular in France, Spain, Madeira, in western Sicily's Province of Trapani, as well as in Greece, Cyprus and parts of the Middle East. It is particularly popular among Jews of North African descent such as the Berber Jews, and is eaten in many other parts of the world as well. Couscous is traditionally served under a meat or vegetable stew. 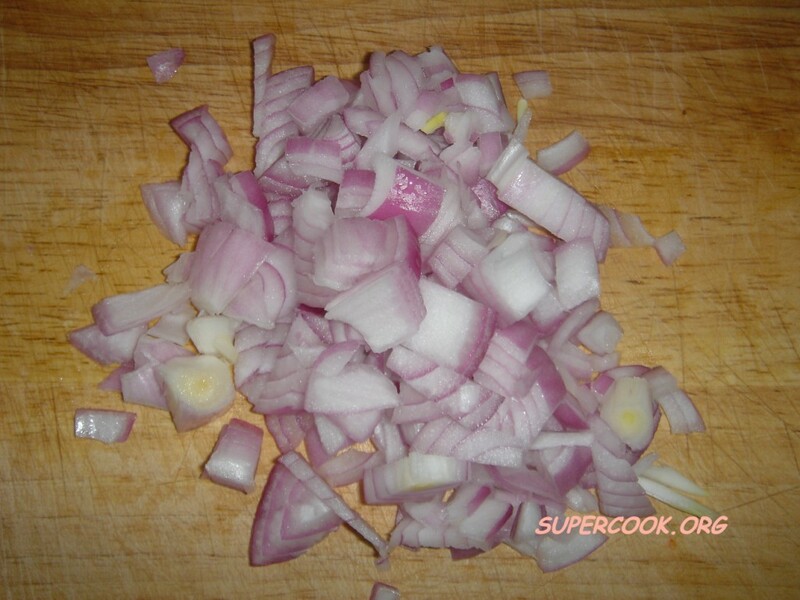 It can also be eaten alone, flavored, or plain, warm or cold, or as a side dish. The couscous granules are made from semolina (coarsely ground durum wheat) or, in some regions, from coarsely ground barley or pearl millet. In Brazil, the traditional couscous is made from pre-cooked sweet-corn flakes. To make couscous from semolina, the coarsely ground durum wheat is sprinkled with water and rolled with the hands to form small pellets, sprinkled with dry flour to keep them separate, and then sieved. The pellets which are too small to be finished granules of couscous fall through the sieve to be again sprinkled with dry semolina and rolled into pellets. 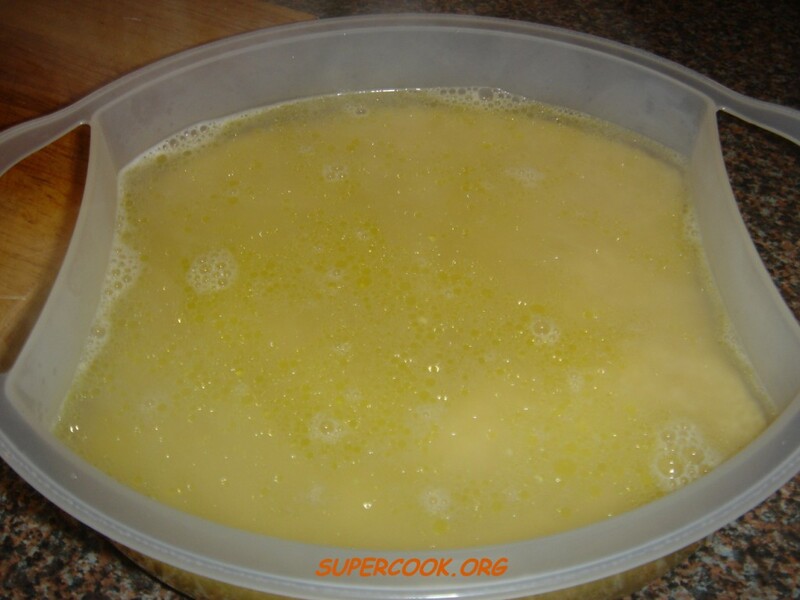 This process continues until all the semolina has been formed into tiny granules of couscous. 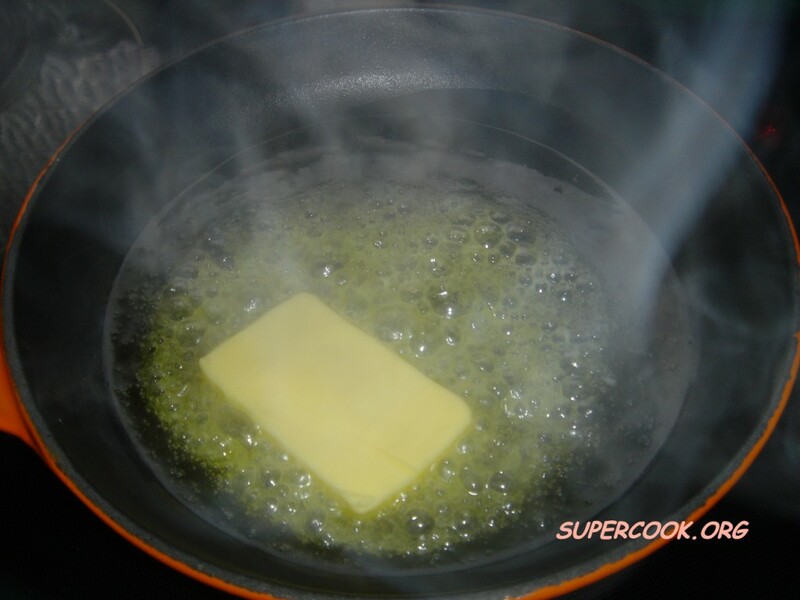 Sometimes salt is added to the semolina and water. This process is very labour-intensive. In the traditional method of preparing couscous, groups of women would come together and make large batches over several days. These would then be dried in the sun and used for several months. Couscous was traditionally made from the hard part of the durum, the part of the grain that resisted the grinding of the relatively primitive millstone. In modern times, couscous production is largely mechanized, and the product sold in markets around the world. Properly cooked couscous should be light and fluffy, not gummy or gritty. 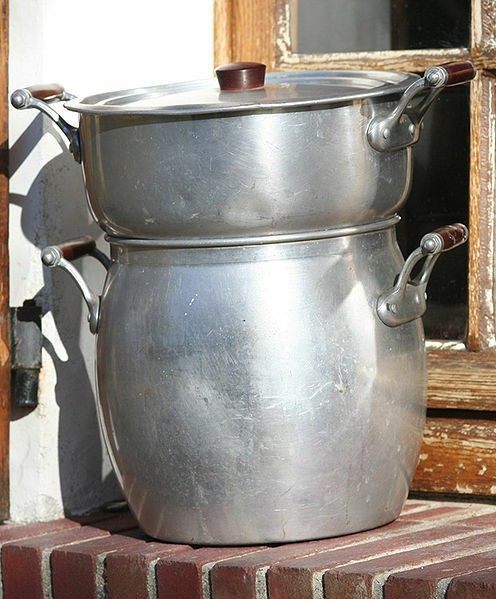 Traditionally, North Africans use a food steamer (called a kiskas in Arabic or a couscoussière in French). The base is a tall metal pot shaped rather like an oil jar in which the meat and vegetables are cooked as a stew. On top of the base, a steamer sits where the couscous is cooked, absorbing the flavours from the stew. The lid to the steamer has holes around its edge so steam can escape. Left: A couscoussière, a traditional steamer for couscous. The couscous that is sold in most Western supermarkets have been pre-steamed and dried, the package directions usually instruct to add a small amount of boiling water or stock to the couscous and to cover tightly for 5 minutes. 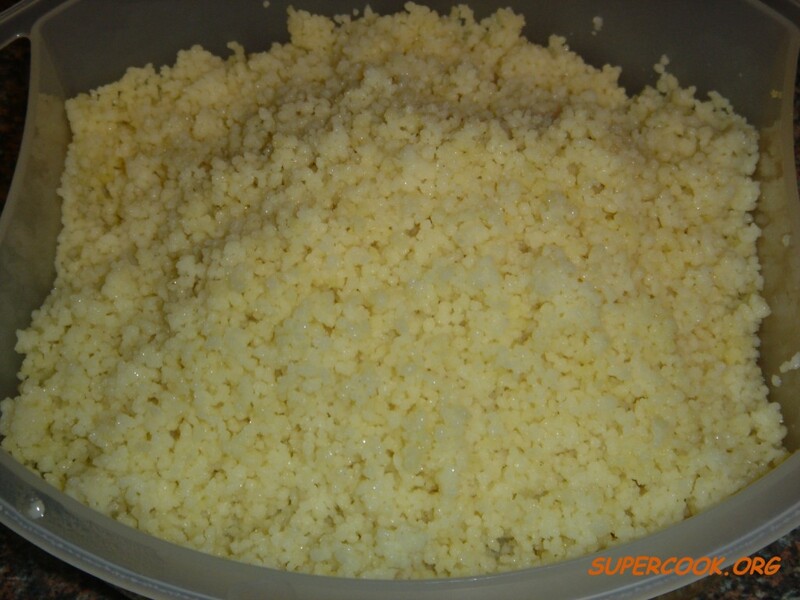 The couscous swells and within a few minutes it is ready to fluff with a fork and serve (see our instructions below). 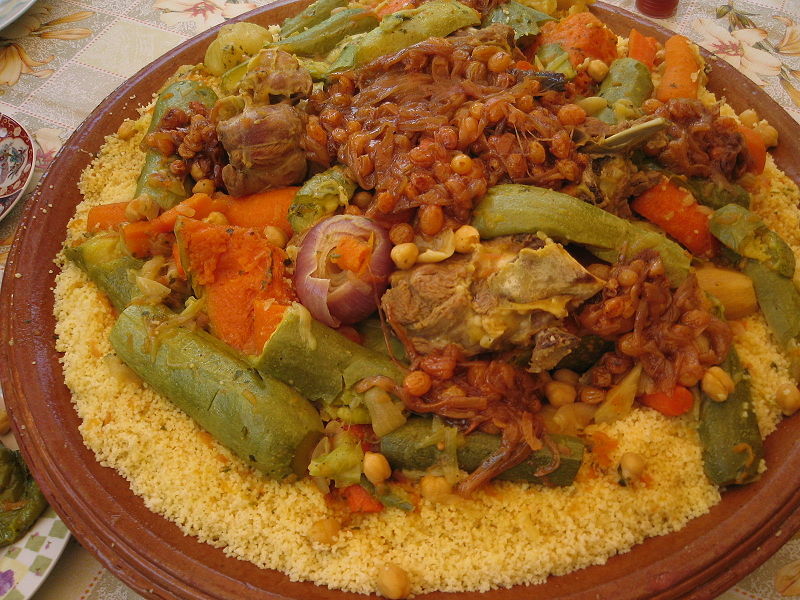 In Libya, Morocco, Algeria, and Tunisia, couscous is generally served with vegetables (carrots, Potatoes, turnips, etc.) 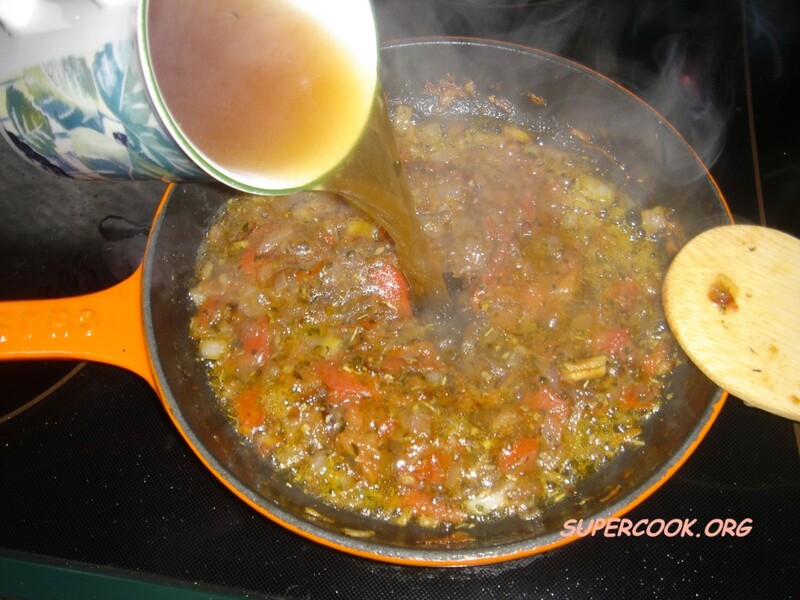 cooked in a spicy or mild broth or stew, and some meat (generally, chicken, lamb or mutton); in Algeria, couscous can also be topped with fish in a sweet sauce with raisins and caramelized onions. 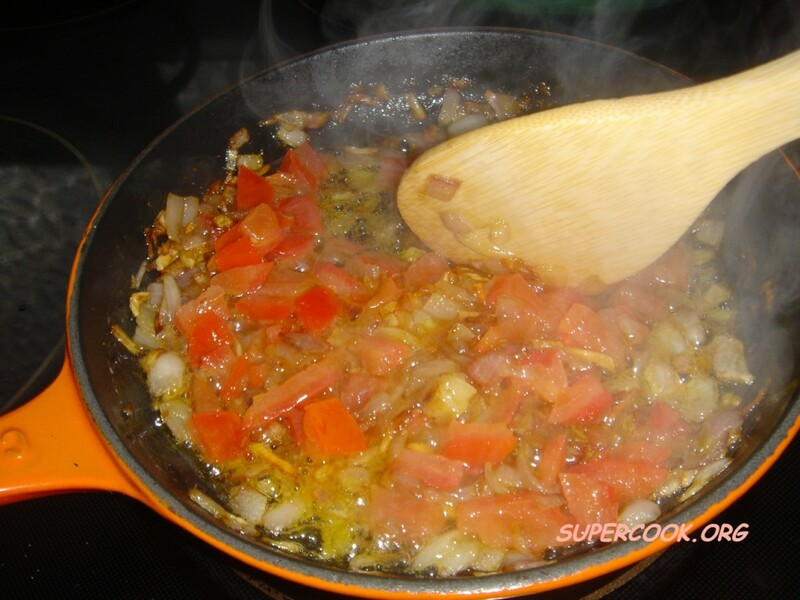 Left: Couscous with tomatoes and onion (see the recipe below). In Libya, it is mostly served with meat, specifically beef, lamb, or camel. Another way to eat couscous is as a dessert; it is prepared with dates, sesame, and pure honey, and locally referred to as "maghrood". In Morocco and Algeria it is also served, sometimes at the end of a meal or just by itself, as a delicacy called "seffa". 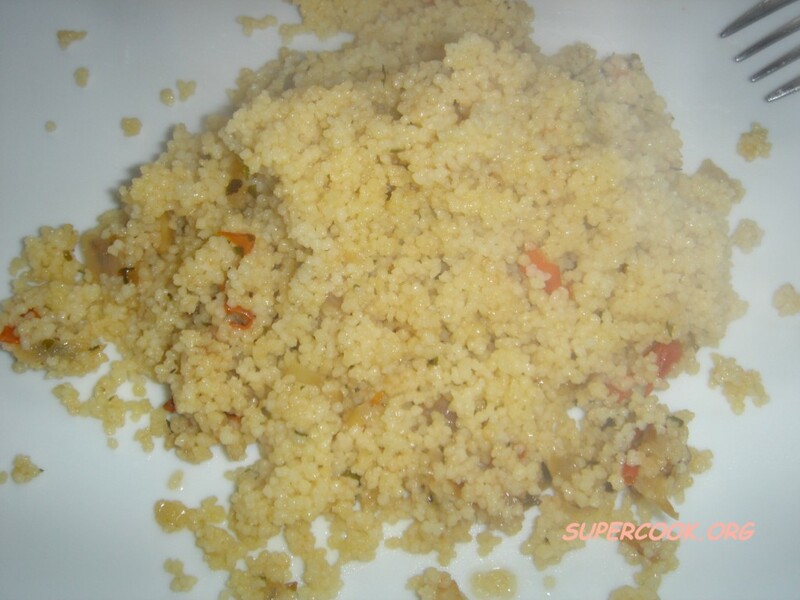 The couscous is usually steamed several times until it is very fluffy and pale in color. It is then sprinkled with almonds, cinnamon and sugar. Traditionally, this dessert will be served with milk perfumed with orange flower water, or it can be served plain with buttermilk in a bowl as a cold light soup for supper. In Egypt, couscous is eaten more as a dessert. It is prepared with butter, sugar, coconut, raisins, nuts and topped with milk or cream. Couscous is also very popular in France and Spain, where it is now considered a traditional dish. Tip the couscous into a large bowl and pour over boiling water or stock: . 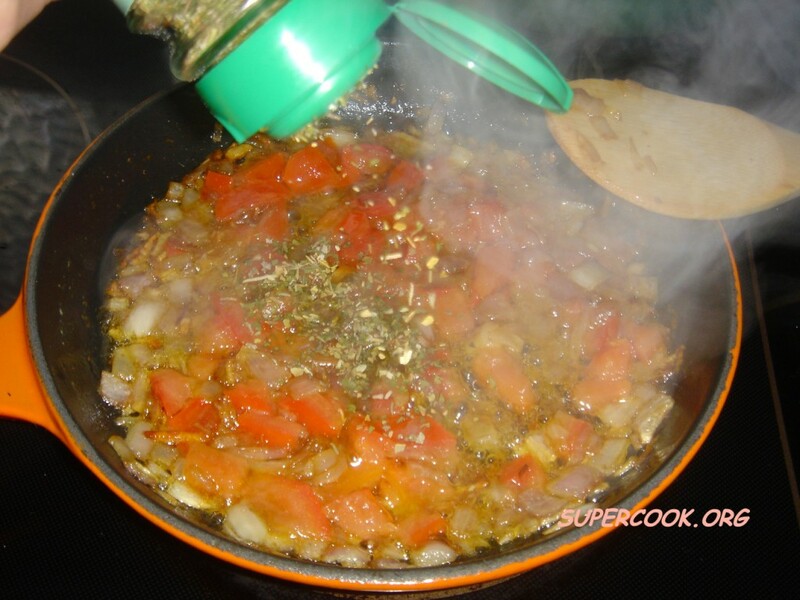 Once all the liquid is absorbed, use a fork to break and lighten up the couscous. 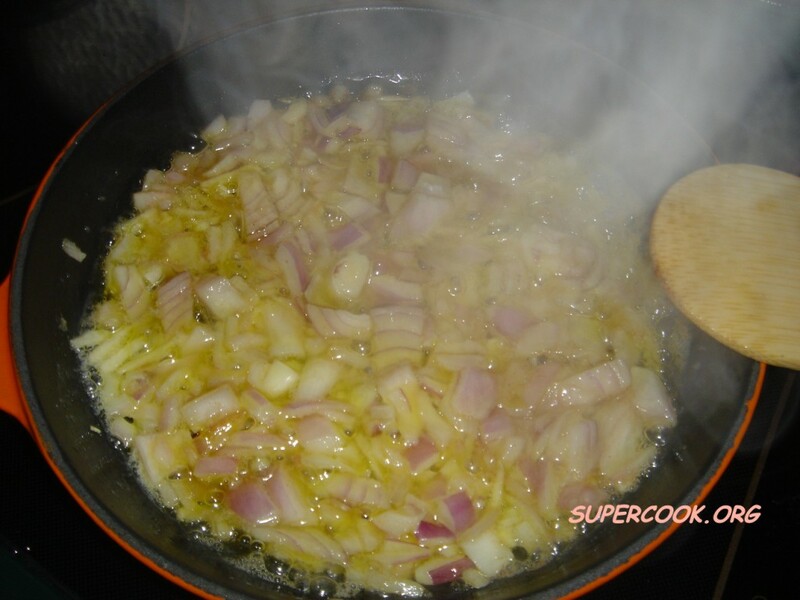 Enrich and moisten with a drizzle of olive oil or a knob of butter if you want.